Garden work (seeding, planting, weeding, irrigating, pruning) has preference and blog posts will only be published when I have time. The following link collection is erratic and incomplete, but its the best I can do in the little spare time left. http://www.pnas.org/content/early/2016/03/16/1523119113.full.pdf Climate change benefits of eating less meat. http://en.granma.cu/cuba/2016-03-28/brother-obama Fidel Castro Ruz. With 89 years still the clearest voice and the sharpest mind of anti-imperialism. https://www.rt.com/op-edge/336440-brazils-revolution-color-escobar/ As said before: The empire never retreats. http://www.unz.com/ishamir/russia-bids-farewell/ This analysis makes valid and also a few not so valid points. Israel Shamir is one of the writers who likes to bend the facts in order to compose a really nice sounding story. Characterizing the Syrian troops as cowards is unfair, as they for five years held out against a constant invasion of well funded and equipped criminal gangs via Turkey, Jordan, and to a lesser extent Israel, suffering 140,000 deaths (SAA + NDF). Which other army would still be able to fight after such a relentless war of attrition and such a terrible bloodletting ? The authors accusations against the Syrian government (“clannishness, a heavy-handed security apparatus, the sore lack of elementary democratic arrangements”) repeats the usual myth’s of Western media without further substantiation. A lie is a lie even if it is repeated a million times! Same goes for the characterization of Dr. Bashar al-Assad (“Stiff-necked he surely is”). If all those alleged faults were problems which had to and could have been fixed to avoid the war, why were Russians themselves not able to fix them in Chechnya? How get the author the impression, that Turkey is willing to reconcile with Russia? The Erdogan regime becomes more autocratic by the day, waging a bloody war against its Kurdish population, imprisoning any dissenters, and constantly violating Iraqi sovereignty with bombing raids and an illegal stationing of 2,000 Turkish soldiers with heavy armor on Iraqi soil. http://www.zerohedge.com/news/2016-03-25/caught-tape-state-dept-says-maybe-russia-syrian-army-shouldnt-take-palmyra-isis The US administration makes it clear to everyone, where its sympathies lie. When Ukraine Premier Arseniy Yatsenyuk announced his resignation, Ukrainians breathed a sigh of relief, hoping for the end of yet another political crisis. But his successor Vladimir Groysman is a crony of President Poroshenko, whose offshore riches were revealed in the Mossack Fonseca leak (the so called Panama Papers). In 2015, as Ukraine’s economy declined further, all top oligarchs were losing billions of dollars in net worth, except Poroshenko, who somehow added 100 million US$ to his previous fortune of 750 million. Nothing will change, and Yatsenyuk’s People’s Front Party, which is being reduced to nothing in opinion polls but is with 81 delegates still the second largest party in the Verkhovna Rada, will continue to support the new government and will be awarded important ministerial positions. Unsurprisingly, the formation of a new government, which seemed like a done deal, has been delayed over fighting for key ministries. Illinois-born US citizen Natalie Jaresko, Ukraine’s finance minister, is about to take control of Datagroup, the Ukrainean telecom company that controls 85 percent of the Ukranian telecom market. Datagroup is owned by Oleksandr Kardakov, who’s personal empire has collapsed due to foreign currency loan debt, and will most likely be sold to Jareskos investment company Horizon Capital. Ukraine’s GDP has contracted by 16.5 percent since 2014. If one excludes the GDP of Crimea and separatist-held territory, the contraction is about 24 percent. A wave of plant closings has resulted in the loss of 700,000 industrial jobs in 2015 alone. The war and the collapse of trade with Russia have resulted in a steep decline in exports, which have fallen to 38.1 billion US$ in 2015, from a high of 68.8 billion in 2012. The hope that greater access to the European market would make up for the loss of exports to Russia remains unfulfilled — since 2011 exports to the EU have fallen by roughly 5 billion US$. Even if the economy should one day unexpectedly and miraculously stabilize, the country will remain impoverished for the foreseeable future, because under IMF loan condition half of GDP growth over 4 percent must be directly paid back to the IMF. The OSCE Mission continues to stubbornly ignore devastating attacks of Ukrainian artillery. The observers never include in their reports the widespread destruction inflicted in the northern outskirts of Donetsk and Gorlovka. When a group of OSCE observers came under mortar fire from the Ukrainian positions in the north of Gorlovka, the OSCE representatives reported only a significant increase in the number of attacks by both sides. They also added that compliance with the Minsk Agreements is the responsibility of the parties and the OSCE can act only as a facilitator of dialogue. With the same indifference the OSCE observers document Ukrainian heavy weapons withdraws from storage sites, including 122mm and 152mm self-propelled artillery systems, tanks, anti-tank cannons, 122mm Grad and 220mm Uragan MLRS. That may be the reason why they don’t mention the devastating effects of attacks on the territory of the separatists, because these attacks are carried with weapons which, according to the Minsk Agreements, should not be located near the contact line at all. Last week I released two hedgehogs, which in fall I had collected as little babies during my forest walks. The winter was mild but the little hedgehogs nevertheless wouldn’t have survived it. 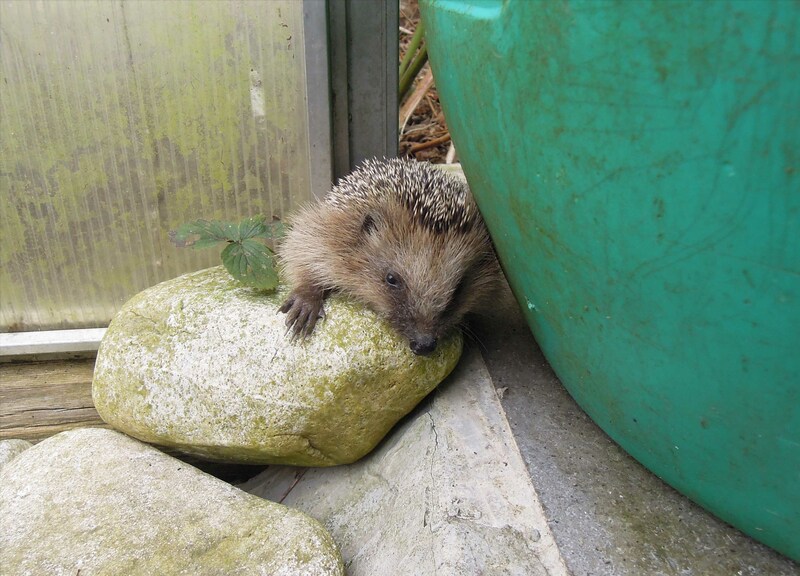 I hosted the hedgehogs in one of the greenhouses, where I piled up twigs and leaves to create a hideout for them. I regularly put cups with cat food in front of the pile and as the cups were always cleared I assumed that the hedgehog children were still alive. In January they didn’t eat much, and I was not sure if they were now hibernating or if they had died, but in February the food cups were cleared again and the amount of disappearing food suggested that they were both alive and well. Winter was very mild and spring started one month earlier than usual. 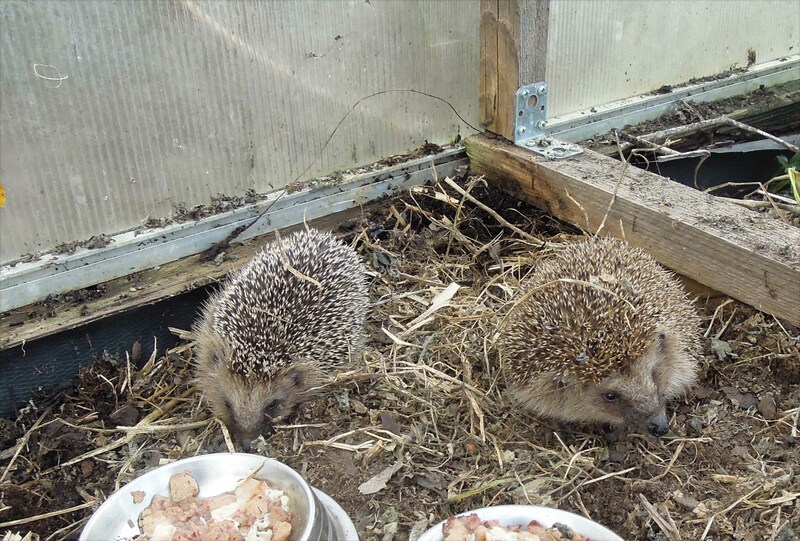 When it got comfortably warm at the end of March I decided to set the hedgehogs free, though it was not an easy decision. I felt a bit like a mother who waves their children goodbye as they are leaving the house to start a new life on their own, independent, unprotected, unguarded. Life can be dangerous, for young humans as well as for young hedgehogs. The hedgehogs can be harmed by ticks, poisoned by pesticides, hunted by owls and ferrets, they can be killed by tractors in the fields and by careless care drivers on the roads. 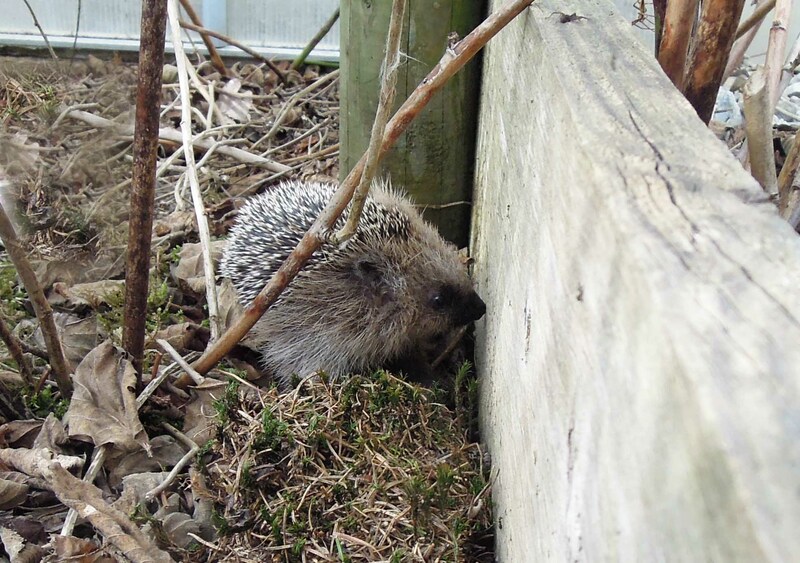 There are too many fields and roads and not enough hedges, forests, and other suitable natural habitats for hedgehogs. So they get less and less, they are an endangered species. 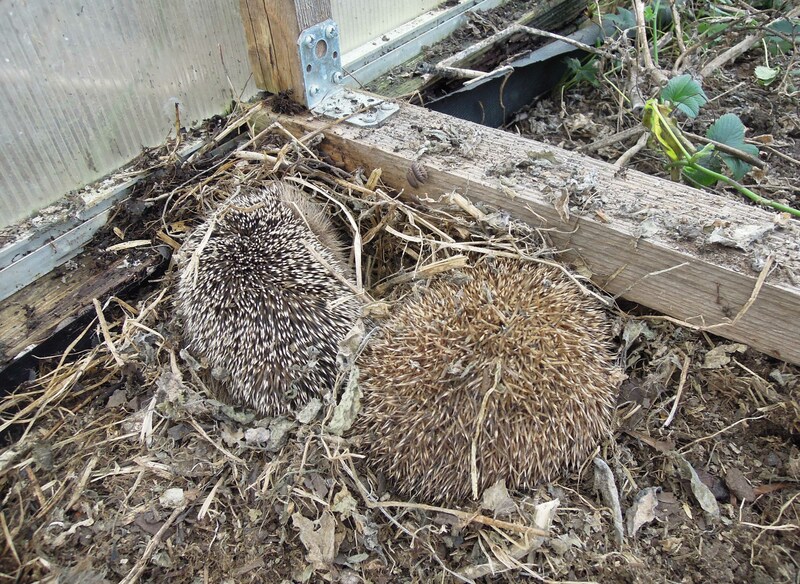 When I carefully removed the twigs and leaves I found the two young hedgehogs side by side cuddling together. Because of their stingy spines, I’m not sure if the term “cuddling” is appropriate, but they obviously had become friends during the winter and liked the close contact. Hedgehogs normally are loners. One of them had become really big, the other had also grown but not as much as his/her companion. When I put them out into the blackberry bushes beside the greenhouse, they sniffed around and the big one soon started to explore the wider area, while the small one first did hide behind a rain barrel and then dug himself a small nest in a nearby pile of leaves. When I looked a few hours later they both had disappeared without a trace. Maybe they moved to the adjacent forest, or to a nearby field, or into a neighboring property. It could also be that they are still in the garden, I really would like to have them here. Maybe one day I accidentally will discover one of them in a remote corner — I would be overjoyed. The frogs have spawned in two of the little garden ponds and tiny tadpoles are drifting, flittering, whirling around. I will relocate some of them to the new ponds which the frogs and toads have not yet used for spawning. There are still some dragonfly nymphs in the biggest pond, the frogs keep them in check but they cannot eliminate them completely. I also accidentally spotted a backswimmer in another pond. They were once my favorites but as they are known to kill tadpoles they have fallen out of favor now. All the peach trees and most of the plum trees are blooming. It could become a god year for fruits if there is not a severe drought again. The cats are all fine and enjoy spring, thank you for asking.